This page describes LDR(Light Dependent Resistor) basics and mention LDR(Light Dependent Resistor) manufacturers. The Figure depicts LDR symbol. 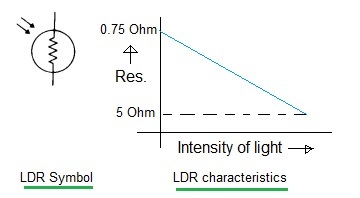 As shown the LDR resistance is sensitive to the application of light. The curve mentions that resistance of LDR varies with the intensity of the light. More is the intensity higher is the resistance. Due to this fact, it is referred as photo resistor or light activated resistor(LAR). As mentioned it has range from 5 Ohm to 0.75 MOhm. There are two types of Light Dependent Resistors viz. Intrinsic and Extrinsic. • The dark resistance of LDR is 0.75 Ohm. • It is used in optocouplers. • Materials used for fabrication are CdS and Se.